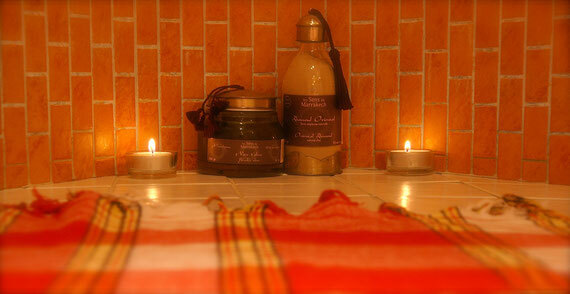 The word for Turkish Bath - the 'Hamam' comes from Arabic and means 'warming '. The oriental bathing culture had its beginnings around 5000 years ago.
" One must say, that one who has not taken a Turkish Bath has never really been washed !" So described Helmuth von Moltke, a military advisor in the Ottoman Empire, circa1835. At the beginning of the Hamam treatment, the guest spends approximately 10 minutes in the steam-bath in order to optimally prepare the skin. Following the steam bath, the guest lies on the heated Hamam bench and is first rinsed with warm water before a full body peeling with a textured glove, and then a relaxing soap-foam massage with a turkish rose soap. Finally, after a final rinse with warm water and drying off, the skin is moisturised with a body-oil or lotion. The skin will be feel polished and silky-smooth!